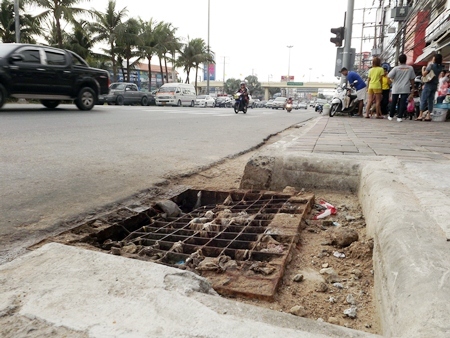 The sidewalk is fixed, but this drain cover on South Road is blocked by garbage and food waste. 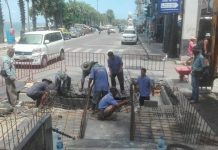 Engineering Department workers recently repaired the footpath near the noodle shop at the South Road intersection, but street vendors continued to dump grease and garbage in the drain, impeding storm drainage and exacerbating flooding. The public needs to realize that littering and misuse of storm drains leads to more problems later. City officials or local residents should clean this and other blocked drains.